Boom has been living in Chiang Mai for almost a year and has fully embraced the “DN” (digital nomad) lifestyle. 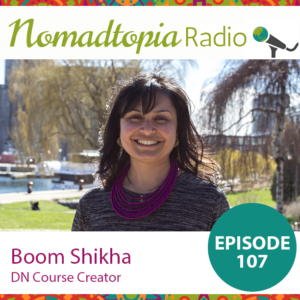 She joined me to talk about selling courses online, breaking through mental blocks, and life in Thailand. Note: Links with an asterisk are affiliate links, which means you may receive free credit or another bonus and I may earn a small commission or other benefits if you sign up/purchase using that link. There’s no additional cost to you, of course! Share the episode and help spread the word by clicking on the icons below.